In general, (recessive) loss-of-function mutations in the ASIP gene, which either impair protein function or reduce its transcription, lead to increased production of eumelanin and to darker coat color as observed in mice , rabbits  or quails . Conversely, (dominant) gain-of-function mutations that display ubiquitous and constitutive expression of ASIP, such as the lethal yellow allele in mice, cause a yellow pigmentation . 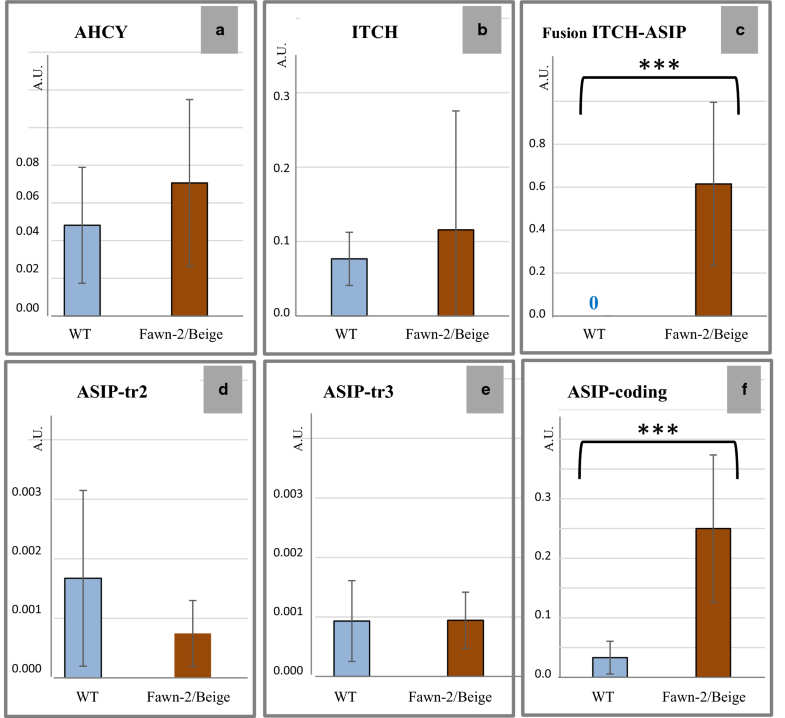 Several studies have shown that structural modifications in the ASIP gene are responsible for lighter coat colors in various species: (1) a large deletion in the lethal yellow allele in mice [5–7], (2) an insertion in the Abr allele in Normande cattle  and in the viable yellow allele in mice [9, 10], (3) a tandem duplication in the dominant white|tan allele in sheep , (4) an inverted duplication in the ASIP gene in mice , and (5) an insertion or an inverted duplication in the white allele in Alpaca . The 141,162-bp deletion that we identified for the yellow mutation confirms previous results . 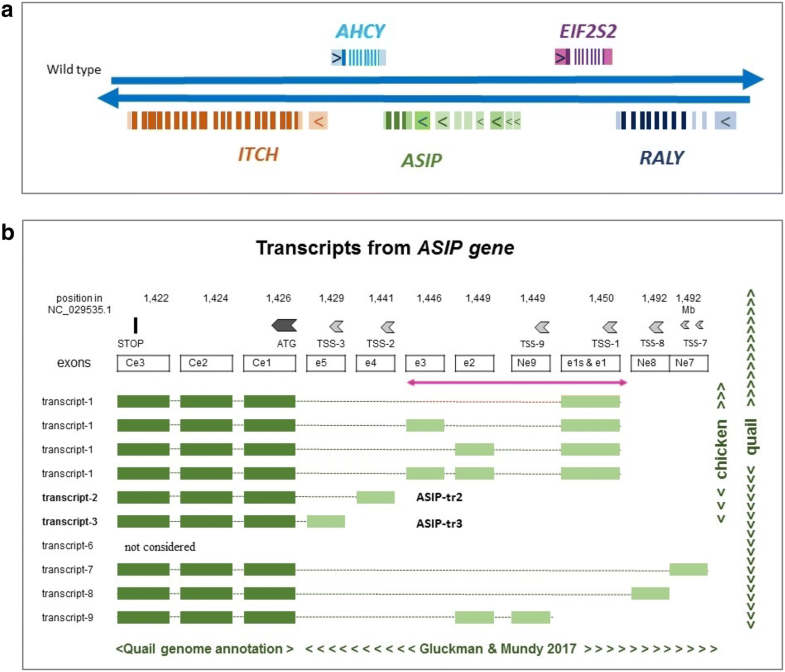 It leads to the creation of a RALY-ASIP fusion gene and deletion of the EIF2S2 gene. The strong similarity between the lethal yellow mutation in mouse [5–7] and the yellow mutation in quail, as previously suspected by Nadeau et al. , is confirmed at the genomic level. 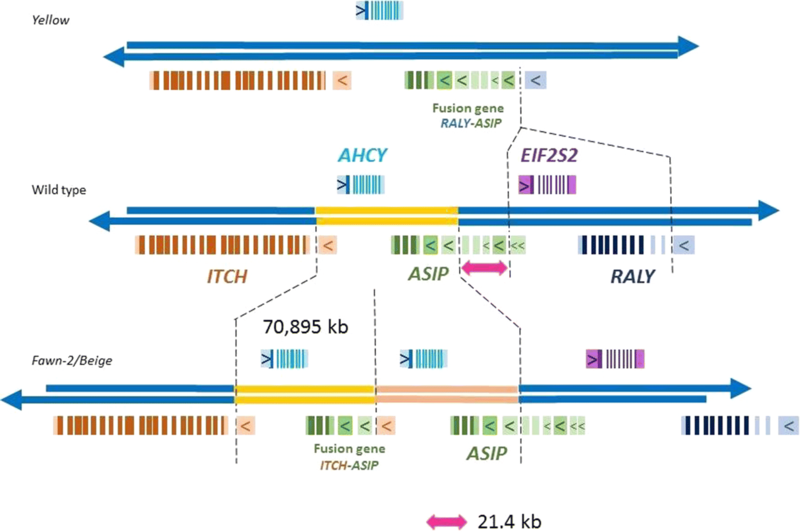 However, our study reveals that the deletion is also combined with a 241-bp insertion, which is mainly composed of repeated sequences that do not originate from this region. Nadeau et al. (2008) showed that this structural modification preserves the coding structure of the ASIP gene but affects the regulatory 5′ region, and results in the production of transcripts from the RALY-ASIP fusion gene . However the expression of the transcripts coding for ASIP is disorganized with no over-expression in the skin [4, 15]. The transcription of the fusion gene depends on the promoter of the RALY gene but its 5′ region may also contain alternative regulatory sequences. In addition, we cannot exclude the possibility that the loss of the 5′ region of the ASIP gene has additional impacts. 12711_2019_458_MOESM1_ESM.docx Additional file 1. Phenotypes of Japanese quail: wild-type and homozygous beige/beige females, homozygous beige/beige males and a heterozygous yellow/WT female. 12711_2019_458_MOESM2_ESM.docx Additional file 2. Alignment of sequence reads [21, 25]. 12711_2019_458_MOESM3_ESM.docx Additional file 3. Additional details for the study of transcripts [31, 32]. 12711_2019_458_MOESM4_ESM.docx Additional file 4. List of primers and sequences used in this study. 12711_2019_458_MOESM5_ESM.docx Additional file 5. 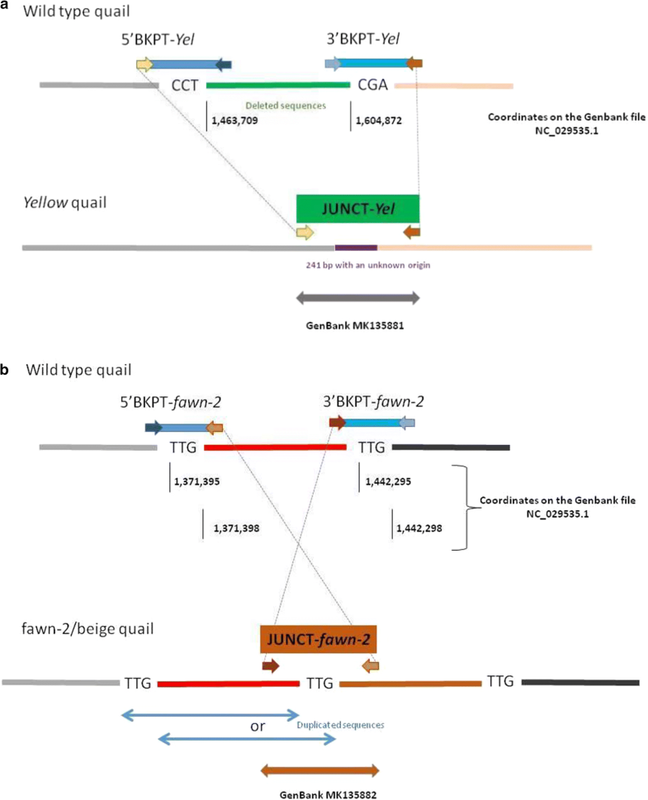 Examination of read alignments for yellow, fawn-2 and beige sequenced genomes.